Always a good idea to check the power-line towers by DeKorte Park for raptors. In the summer, it's usually Osprey. 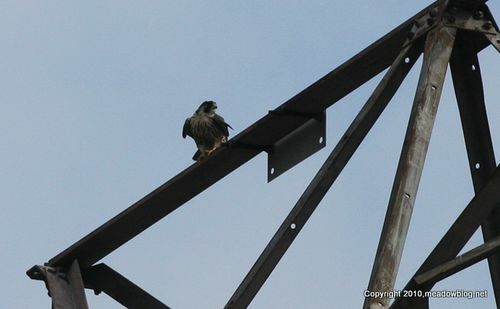 Today, it was a young Peregrine, perched near the park's entrance. 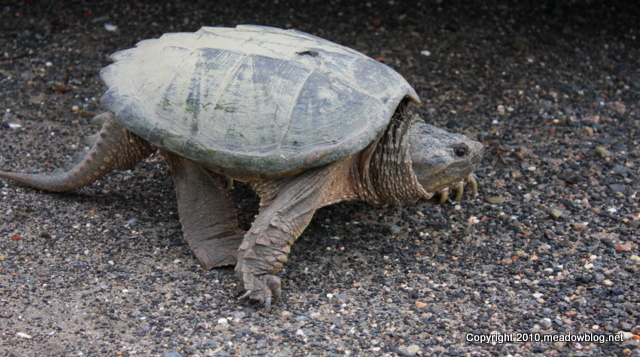 The guy above isn't the largest Snapping Turtle we've ever seen, but he was pretty big, and he was crossing Disposal Road near the Carillon just after lunch today. (Reposted) Erica Mueller recently photographed a (non-poisonous) snake by the bird-banding station at the closed Erie landfill. The Monarch migration continues. 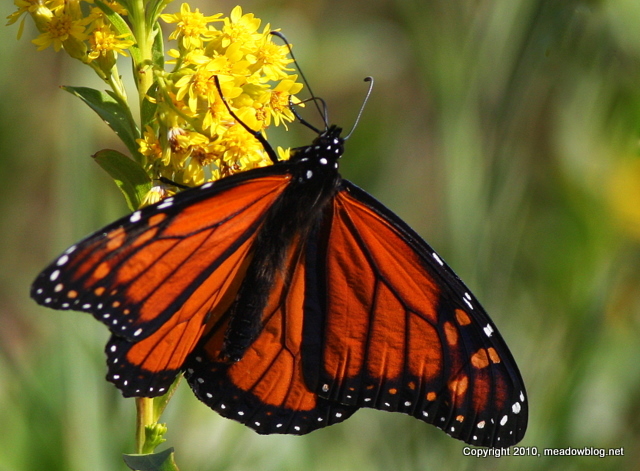 We caught this newly minted Monarch on Goldenrod at Harrier Meadow on Wednesday morning. More on the 2010 fall Monarch migration here. As of late Thursday, the tide gates for the Shorebird Pool (aka the Kingsland Impoundment, the first body of water on your left as you enter DeKorte) are open, exposing this tidal impoundment to the ebb and flow the tides. At low tide, this means mud flats. 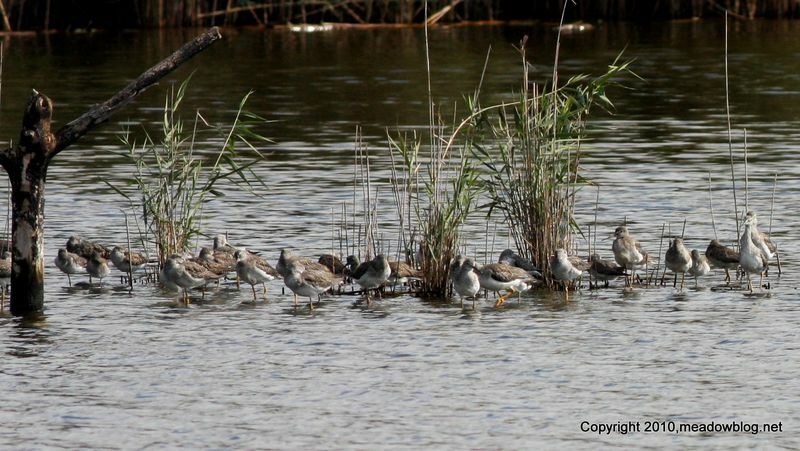 We have had yellowlegs here this week. As a rule of thumb, tides are roughly 1-2 hours later than the tides at the Amtrak RR Bridge on the Hackensack River. You can click here to get those tides. For example, low tide on Saturday in the Shorebird Pool should be a bit after noon. Note, tides are affected by all sorts of factors, including rain, wind and Moon. In other words, water depth at low tide can vary drastically. A lengthy but riveting explanation of how to predict tide follows.